Title text: Since delays should get less likely closer to the launch, most astronomers in 2018 believed the expansion of the schedule was slowing, but by early 2020 new measurements indicated that it was actually accelerating. Late 2026? I'll be fifty ... or dead ... or both. Wonder what a 3rd-order polynomial fit predicts. Better late than irreperably messed up. Because if the slope was one it would mean no progress is being made haha. At least the slope isnt greater than one. Does anyone have the source numbers compiled? A second-order regression might point closer, maybe late 2024. Either way, I hope we get as much extended life from it as from the Hubble. Engineering of new things is hard. Last edited by petercooperjr on Mon Jul 02, 2018 5:17 pm UTC, edited 1 time in total. "What determines the ship date is the team's commitment to a ship date. We must make our RTM date." heuristically_alone wrote: Because if the slope was one it would mean no progress is being made haha. At least the slope isnt greater than one. I think the slope for implementing nuclear fusion power plants is greater than one. I like how the estimated launch date trend line goes past the intersection; as if after the 2026 launch, in 2030 the launch will be estimated for 2028. It's tough when there are no WWII German rocket scientists left or when your scientists are busy reading Dilbert and xkcd. It was very close to 1 for quite a long time, but it seems to have been dropping recently. 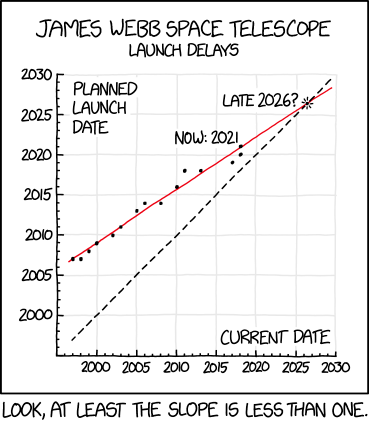 Carteeg_Struve wrote: I like how the estimated launch date trend line goes past the intersection; as if after the 2026 launch, in 2030 the launch will be estimated for 2028. I think the implication is that it'll have such a history of delays that future recollections of when it did launch will wander forward by way of a particularly strange inertia -- with futurefolk getting confused, looking it up, and using said history to explain their error once confronted with the actual date. Ummm... no... Management always lies by a factor of at least 2 when reporting engineering estimates to customers. Sableagle wrote: Late 2026? I'll be fifty ... or dead ... or both. That happened to Hubble, right? They launched after plenty of delays, and then they had a second launch three years later to fix the problems of the first one. It links to two twitter posts, the first of which might be the basis of this comic. I was coming here to post this if somebody already hadn't. Which is a good data point indicating that JWST will be up in 2026. I am more hopeful for the Large Synoptic Survey Telescope, nearing completion on Cerro Pachón ridge in Chile. LSST is a point and shoot: fast slewin and stabilizing, then collecting two images in ten seconds with an 8.4 meter primary mirror and a 3.2 gigapixel imager the size of an SUV. It will generate 20 petabytes of images per year. The air on the ridge is dry enough for near-IR imaging. We may expand the dwarf planet inventory 10 to 100 times; perhaps we will add a real planet or two to the list. Mostly, I hope we will image 100 times as many small, earth-approaching asteroids and comets. JWST is designed to image much further into the infrared; when (if?) it launches, it will see new objects as well. I expect JWST will be the last of the large, unitary, "expensive to launch" telescopes. The next generation of space telescopes may be free-flying mirror swarms designed for hundreds of ultra-cheap launches. Completion of George RR Martin's Winds of Winter would take a similar trajectory.